As we continue you along with bread recipes for this week, I get the chance to post a biscuit recipe that I recently tried. Usually, I don’t stray too far from the norm when I make biscuits. I have 2 recipes I rely on pretty heavily – one for quick biscuits and one for a traditional biscuit. However, when I saw this recipe in an old issue of Cook’s Country, I was intrigued. It is a recipe for what is called derby biscuits. Derby biscuits are basically appetizer biscuits that are perfect for use for small finger appetizers involving meats and cheeses. They are biscuits that have been around for hundreds of years, and the traditional recipe, according to Cook’s Country, is one where the cook needed to beat the dough as a way of leavening it. This was before the days of baking powder and baking soda. The biscuits themselves are very crisp and unique, perfect for use for appetizers. I decided I would give the recipe a try. Adjust an oven rack to the middle position and heat the oven to 350 degrees. Line a rimmed baking sheet with parchment paper. Pulse the all-purpose flour, granulated sugar, baking powder, and salt in a food processor until the ingredients are combined, about 3 or 4 pulses. Add the butter pieces and pulse the ingredients until the butter is reduced to pea-sized pieces, about 10 to 12 pulses. Transfer the mixture to a large bowl. Add the milk and stir the mixture with a rubber spatula until shaggy dough forms. Turn out the dough onto a heavily floured counter and knead the dough until it comes together entirely and feels smooth, with a few small butter flecks still visible, about 8 to 10 turns of the dough. Roll the dough into an 11-inch circle that is about a 1/2-inch thick. Using a 2-inch biscuit cutter dipped in flour, cut 22 to 23 rounds from the dough. Re-roll the scraps once to a similar thickness as the original dough and cut out 5 or 6 more rounds to yield 28 biscuits. Space the biscuits evenly on the prepared baking sheet. Prick each biscuit 3 times with the tines of a fork. Bake the biscuits in the oven until the tops of the biscuits are a light golden brown, about 27 to 30 minutes, rotating the baking sheet about halfway through the cooking process. Let the biscuits cool on the baking sheet for about 5 minutes, then transfer them to a wire rack. Serve the biscuits warm or at room temperature. Of course, the new recipe doesn’t involve beating the dough by hand and makes good use of the food processor and baking powder to mix everything and get the proper texture for the biscuits. The biscuits are very crispy on the outside and still tender on the inside, almost like a cross between a biscuit and a cracker. There is also a hint of sweetness in the biscuits from the sugar and milk that is quite nice. While I initially served the biscuits with our dinner, I found they worked great for a breakfast biscuit with a piece of sausage on them. I think they would go very well for a small ham and biscuit appetizer or even with some cheese on them. I could also see them going nicely with some jam, preserves or jelly. 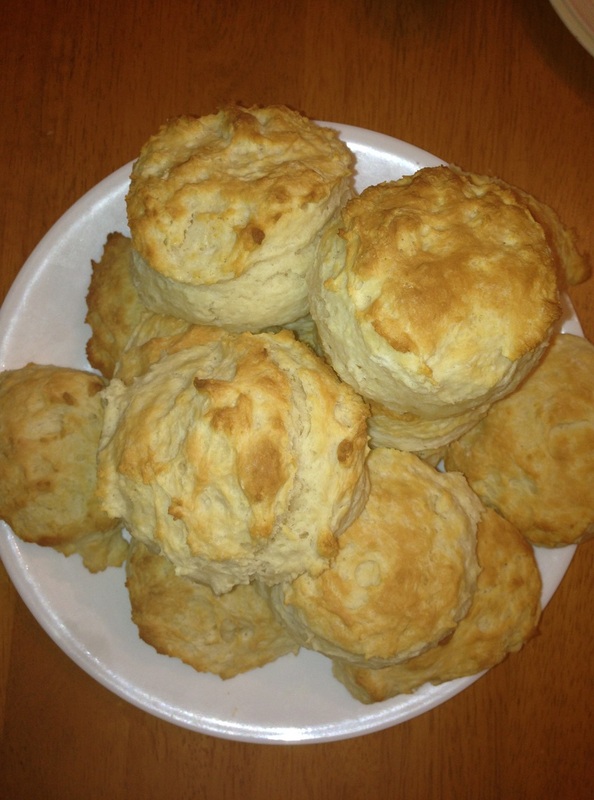 One thing I will say about the recipe I tried – I didn’t get 28 biscuits out of the dough. I did get 20 (the small biscuits in the picture are what I call the “dog biscuits,” since I usually make 1 or 2 sized for him), and perhaps I didn’t roll the dough out into a large enough circle to get more, but in any case, I got plenty of biscuits for just the three of us to use for days. I would certainly keep this one in mind again to use for a party where we wanted appetizers with biscuits because it is easy to make and yields a nice product. That’s all I have for today. Check back next time for another recipe. Until then, enjoy the rest of your day (it is beautiful here in NY, sunny and in the mid-60s) and enjoy your meal! 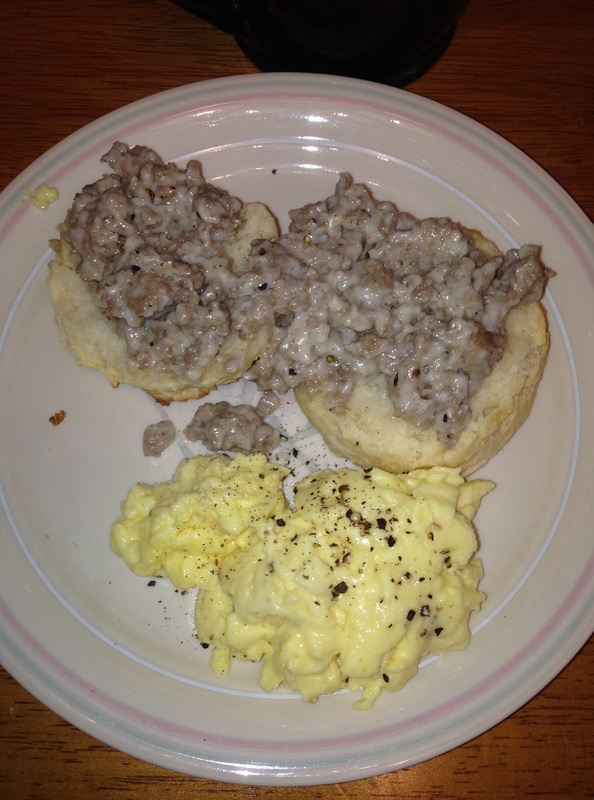 I’ve had a craving for biscuits and gravy lately and yesterday stopped over at Adam’s Farms and got some of their homemade bulk breakfast sausage so I could make some this morning for our Sunday breakfast. Sunday breakfast is usually the only day during the week where Sean, Michelle and I get to eat breakfast together, so we try to make it something different and special each week. I was looking for something quick and easy to use for the sausage gravy and for the biscuits, but I wanted homemade biscuits, not the stuff you get out of the refrigerated can. I turned to Food Network and found a good biscuit recipe from Alton Brown for southern biscuits to go alongside of the sausage gravy recipe I got from Bobby Flay. Both are really easy to make so you can get a different taste for breakfast in no time at all. In a large mixing bowl, combine the flour, baking powder, baking soda and salt. Using your fingertips, rub the butter and shortening into the dry ingredients until the mixture looks like crumbs.Try to do this quickly so that the fat does not completely melt. Make a well in the center of the mixture and pour in the chilled buttermilk. Stir just until the dough comes together. The dough will be very sticky. Turn the dough onto a floured surface, dust the top of the dough with flour and gently fold the dough over on itself 5 or 6 times. Press into a 1-inch thick round. Cut out the biscuits with a 2-inch cutter, being sure to push straight down through the dough. Place the biscuits on baking sheet so that they just touch. Reform the scrap dough, working it as little as possible and continue cutting. 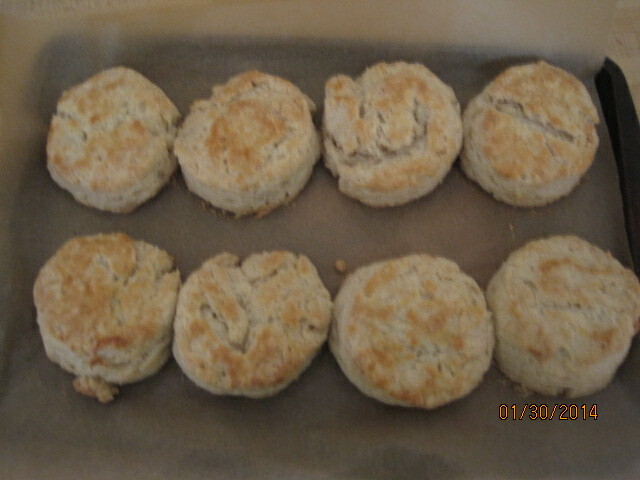 Bake until the biscuits are tall and light gold on top, about 15 to 20 minutes. In a large pot, add the sausage and cook until it is browned and cooked through. Drain the grease and add the flour to the sausage. Cook the sausage in the flour over medium-high heat until the sausage is well-coated with the flour. Add the milk and stir until the gravy has the desired thickness and add salt and pepper, to taste. Serve with the biscuits. I did change up the sausage gravy recipe a little and did not use the 1/2 gallon of milk. I only use about 3/4 of a cup along with a 1/4 cup of heavy cream because we like a gravy that is much thicker for the sausage, and it turned out perfect. The real star here though is the biscuits. These are really easy to make, smell great and taste awesome. You could use these for all kinds of breakfast sandwiches that you like if you didn’t want the sausage gravy, like bacon, eggs, ham or anything else. They are also a great dinner biscuit and I plan to use the rest to go along with dinner tonight. You could even just have one warm with some butter to go with your tea or coffee in the morning and you would be all set. So yesterday was for a basic fried chicken sandwich from Cook’s Country, which was very tasty. Today is something that is just as easy, might taste even better and is a little more homemade. The recipe id for fried chicken biscuits and is from Bon Appetit, who got the recipe from the Pies-N-Thighs restaurant in Brooklyn, New York. The recipe sounded too good to pass up – delicate and spicy fried chicken on a nice fluffy homemade biscuit with honey butter. How could you not at least give it a try? For the chicken cutlets, combine the buttermilk, hot sauce, salt, black pepper, and cayenne in a resealable plastic bag; add the chicken. Seal the bag, turn the bag several times to coat, and chill the chicken in the refrigerator for at least 3 hours. For the biscuits, preheat the oven to 375°. Pulse the baking powder, salt, sugar, baking soda, and 5½ cups of flour in a food processor. Add the butter and pulse until the texture is of coarse meal with a few pea-size pieces of butter remaining. Transfer the mixture to a large bowl. Mix in the buttermilk with a fork, then gently knead the dough just until a shaggy dough comes together. Pat out the dough on a lightly floured surface until it is about 1¼ inches thick. Cut out the biscuits with a 3” biscuit cutter, re-rolling the scraps once. Place the biscuits on a parchment-lined baking sheet and brush the tops with egg. Bake the biscuits until they are golden brown, about 30–35 minutes. To make the honey butter, mix the butter, honey, and ½ a teaspoon of the salt in a small bowl until smooth; set the honey butter aside. To prepare the chicken, pour the vegetable oil into a large skillet, preferably cast iron, to a depth of ½ an inch and heat the pan over medium-high heat until the oil bubbles immediately when a little panko is added. Meanwhile, place the panko bread crumbs in a shallow bowl. Remove the chicken from the marinade; season it with salt and pepper. Dredge the chicken in the panko, shaking off any excess. Working in 2 batches and maintaining the oil temperature, fry the chicken until it is golden brown, crisp, and cooked through, about 3 minutes per side. Transfer the chicken to a paper towel–lined baking sheet to drain. Split the biscuits and spread each side of the biscuits with 1 tablespoon of the. reserved honey butter. Build the sandwiches with biscuits, chicken, and hot sauce, if desired and serve. Just a couple of things about these recipes. I used chicken tenders that I had bought on sale this past week instead of the chicken breasts and they seem to work out just fine for me. I think you could probably just as easily use boneless thighs as well if you like them better. i did have a little trouble with the panko bread crumbs not sticking very well to all of the chicken pieces. I think I might flour them a little next time after they come out of the marinade to make them stick better, but overall the flavor was really good. To me, the real winner here is the biscuits. They tasted really good and were nice and fluffy. The recipe calls for you to use a 3 inch biscuit cutter, which seemed too big to me so I made them smaller, using a 2 inch cutter and got more biscuits out of the batch so we were able to use them for other meals. Everyone loved the biscuits so I know I’ll be making this one again. I made a little cole slaw to go along with the biscuits. 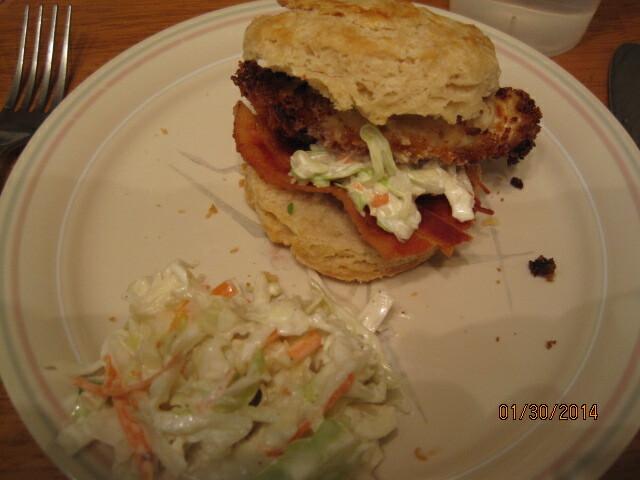 I tried a different recipe this time, which I will post soon, but you can use any cole slaw recipe you like best.